I love everything about this quilt. Warning: lots of photos, the first batch were taken on my dining room table, AKA as the cutting table and design area. The fabrics are from the first two collections from Parsons Gray. I won one collection and purchased the other, plus some co-ordinating fabrics suggested by Pink Chalk Fabrics. The quilt is fully reversible, the "back" features Greek Cross blocks, an easy switch up because they use same components as the Churn Dash blocks. Now, for the backyard photos. Sorry, I warned you, lots of photos. I shipped it across the country to my 17 year old grandson Brett. It was a surprise gift. Brett's a great guy and a great athlete. He eats, sleeps and breathes soccer. He's the only grandchild who hasn't ever asked for a quilt. I'm happy to say he loved his quilt, and told his Mom, she couldn't have it. He put it on his bed immediately, with the reverse side showing! Of course he did, it's much more masculine. 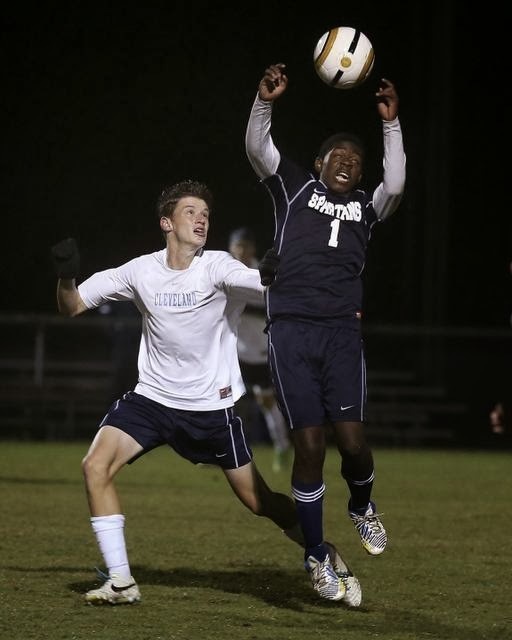 Here's a photo of Brett, in the while shirt, playing soccer, from their local newspaper. And finally, a glimpse of the best quilt model, Bob. I'm entering in the Bed Size Quilt category. The quilt measures 92" x 67", a large twin size. You did a great job making a 'boy' quilt. It can be quite challenging to find the right fabric selections. Yours are great. This really turned out nice! Love the back as well. I love this one - especially the back! I've never seen that churn dash variation before. Love a good churn dash quilt!! I love this quilt and I'm with him, the back is so great, but I'm always doing that with your quilts, never sure which side I like best :) I thought there was a Bed Sized in the original post. This is a wonderful quilt. Great selection of fabrics. Love the look on both sides! what a great quilt! I love churn dash blocks! I love two-for-one quilts!! Neat Greek blocks using those components! i love the sweet simplicity of this quilt. Fabulous back too. Great quilt. I like the darker background on some of the churn dash blocks. Really adds interest.